The so what is that we rarely move directly from “broken” to “fixed” or “doesn’t work” to “does work.” There is an important interim step – “could work,” and too often people fail to appreciate the value of this uncertain time. We all experience that feeling when we are dealing with a problem or challenge when we realize we have found a solution that could work. When we reach this stage, things are still not working, but we have turned a corner. We have a way forward that may get us where we need to be. This state may be very short lived, or it may last years. It all depends on the nature of the thing that doesn’t work. When the Wright brothers realized that they had an idea that could make flight possible, it still took them several years to create an airplane that “did work.” “Could work” is essential to all learning, just as it was for the Wright brothers. 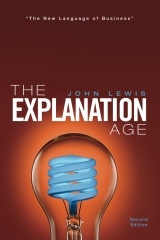 The Explanation Age, Dr. John Lewis Ed.D. This is a key message of The Explanation Age by Dr. John Lewis, Ed.D. This book reveals an important truth about the way organizations learn and grow. The models that organizations use today to drive innovation and change are fundamentally flawed. Tools like Six Sigma, Business Process Reengineering, and Kaizen, which are great for optimizing industrial processes, fail miserably when applied to learning processes like innovation and change. The fundamental problem is that they treat organizations like machines rather than collections of human beings. They are binary, because machines are binary. Things either work or don’t work. These processes and tools ignore the essential “could work” phase, so they ignore an essential part of human learning. In The Explanation Age, Dr. Lewis’s Innate Lessons Cycle model offers an alternative that embraces all three states of workability. By doing so, his model allows an organization to think about and act on problems the way the human beings who make up the organization do. When things “do work,” organizations can optimize existing processes, products, services, etc., while integrating new ones. When things “don’t work,” they can think about what went wrong, explore root causes and implications, and investigate what can be done. When things “could work,” organizations can plan and create solutions that can ultimately achieve the state of “does work.” Lewis’s model gives organizations a way to deal with challenges the way the people who work there do naturally. As leaders, we must help others embrace the uncertainty of “could work.” We must recognize the discomfort and stress it creates. We must act to channel this stressful energy towards finding ideas and solutions. We must also help others recognize when we have “could work” and how we should move forward. All leaders understand that one of the most important roles they play is enabling others to fix things that “don’t work.” One of the things that distinguish great leaders from the rest is their ability to embrace uncertainty and ambiguity and to recognize the opportunities they present. When we help others see what “could work,” we enable them to turn problems into solutions. When we embrace the uncertainty, we help others understand that it is a price we pay for the value we hope to create.